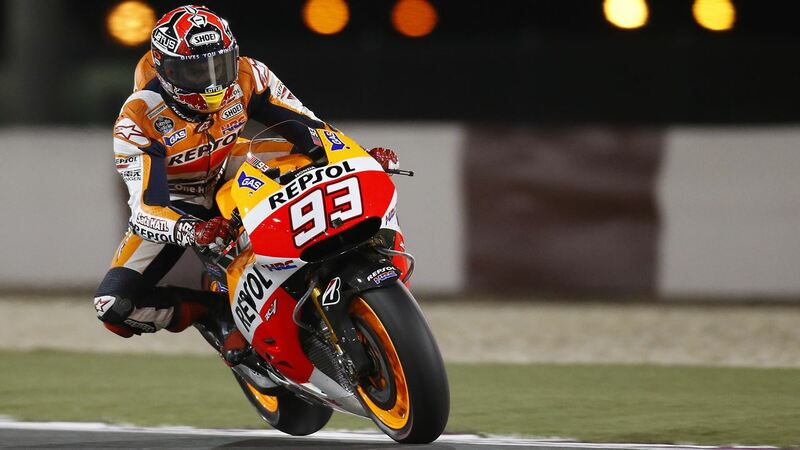 Repsol Honda’s Marc Marquez grabbed pole position for the first race of the 2014 MotoGP season in a thrilling Qualifying Practice 2 session that saw the front row split by just 0.094 seconds. After a strong showing in today’s FP4 session where he finished second quickest, Marquez went one better in QP2 to set a lap time of 1’54.507 to claim pole position from GO&FUN Honda Gresini’s Alvaro Bautista by a mere 0.057 seconds. 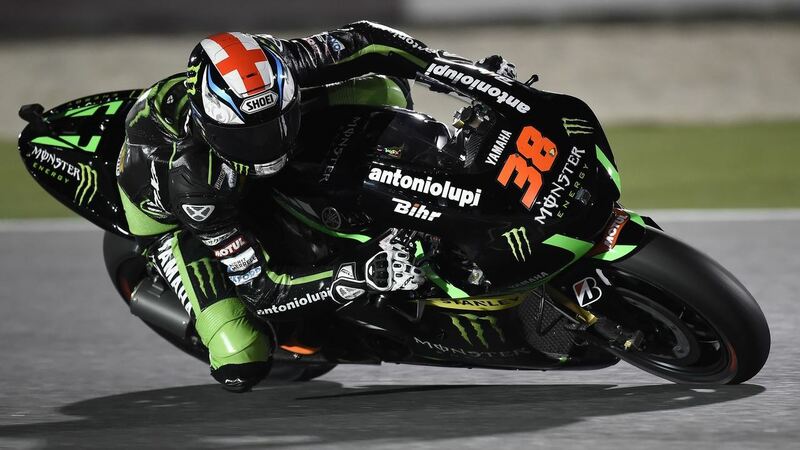 Rounding out the front row for tomorrow’s race is Monster Yamaha Tech 3’s Bradley Smith, the British rider’s personal best lap time of 1’54.601 good enough to claim his first front row in MotoGP. All riders on the front row set their quick times on the combination of the medium compound rear and hard compound front slick. The first QP2 session of the year was fiercely competitive, with 0.645 seconds separating the twelve riders taking part at the chequered flag. Overnight rain, strong winds and cooler track temperatures than yesterday threatened to reduce grip levels even further today, but surprisingly, after Free Practice 4 many riders commented that track conditions were the best of the weekend so far. Track temperatures reached a maximum of 22°C in today’s sessions, ten degrees cooler than yesterday. In FP4, many riders performed long distance runs to assess their race tyre options, with the most popular front tyre option being the hard compound. For the rear tyre, the Factory Ducati, Honda and Yamaha riders had a preference for the medium compound rear, while some Open-class riders achieved good results on the soft compound rear slick. 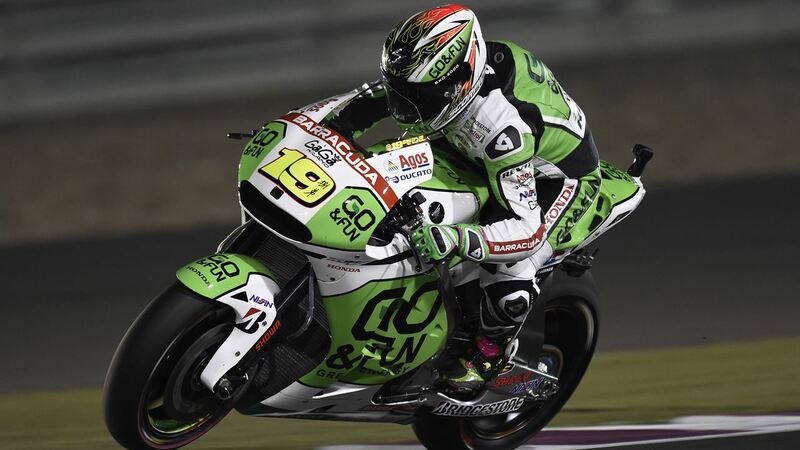 For qualifying, the need for maximum performance was reflected in the riders selecting the softest rear slick available to them; medium compound for the Factory Honda and Yamaha riders, and the soft compound for the Ducati and Open-class riders. “For me this second place on the grid feels like a pole position, because in this circuit I’ve always struggled in the past. During this weekend instead I have always felt comfortable with the bike, closing each practice session in the top positions, which means that we have worked very well in winter testing. Too bad only to have lost the pole position, but in the end Marquez has been capable to overtake us. Tomorrow I expect a very tough race, but definitely interesting, because there are many rides who can keep the same pace. Moreover, it will be important to start from the front row. I hope you continue to enjoy myself like I’ve been doing so far: I will try to stay in the leading group and trying to achieve a podium finish”. “I am really pleased with today, the bike felt great and I’m really satisfied with the setup. The performance during the fourth free practice session was very promising and fortunately I was able to translate that performance to the new tyre. I was slightly disappointed because with the second tyre, Aleix, Marc and I, all waited a bit too long, as nobody wanted to be followed. My tyres got too cold to push again, so I decided to take the bike back to parc fermÃ© instead of taking any more risks, but I felt I still had some margin. However, you don’t get points for qualifying, tomorrow is when it really counts and there are 22 laps to battle in. For sure a good start is the key and I know I’m pretty good at them. I also know that I will be strong on the full fuel load as I worked a lot to improve this during the winter. Having said that, there are a lot of strong riders behind me and it won’t be easy, but I’ll give it my all. Tonight I will rest up, and prepare myself and if the bike feels like it did today, I am confident of getting a good result“. “I am happy with how I performed during my first qualifying session today. After yesterday, it took me a little time to rediscover my rhythm, but the most important fact is that I again, have a great feeling with my bike. Of course, tomorrow the race might be different, but after a tough day yesterday I’m really satisfied with my performance during the qualifying. Unfortunately we had to go through Q1 which was not ideal , especially because that meant that we had to maintain an already used front tyre for the final qualifying practice and the grip wasn’t the same anymore. I didn’t feel that I could push quite as much into the entrance of the corner, which is where the Yamaha is the strongest. Still, I was only 6 tenths of a second from the top lap time, almost half a second from Jorge, and less than a tenth from Valentino. After looking at these statistics, I think I can be satisfied, and also because I believe that my fastest lap time today was very similar to what will be my race pace tomorrow”. “I am satisfied with regard to the improvements shown today, but unfortunately I was slowed down by a problem with the electronics just as I was busy in the qualifying session. When I entered the track, I felt that something was wrong: the engine cut power continuously, so I came back to the pits to try to solve the problem, but it was still there in my second exit. Therefore I got on the second bike, with which I set my fastest lap, but unfortunately there was time only for one attempt. However I’m happy because I found myself even better with the bike n.2, which I will ride again tomorrow in the warm up, during which we will also try to figure out which tyre we can use for the race. It would be nice to get some points tomorrow”.